WASTE is any task in a process that is not required to complete a process successfully. When Waste is removed, only the tasks that are NECESSARY to deliver a satisfactory product or service to the customer remain in the process. Not only is this waste hard to identify, but it’s also very costly over the course of a year. What value does MotionMeter provide? MotionMeter by Newcastle Systems is a free user-friendly app (available for both Apple and Android devices) that enables you to quickly perform your own time studies by capturing the time of core processes within your business. It can help you identify which step of the process is NECESSARY (Value Add) or WASTE (non-Value Add). It’s also an ideal tool to capture data of specific steps (or tasks) in lieu of performing a full-scale process time study. From there, a comprehensive overview will outline how much the wasted motion is costing your business and how much you could save annually if that motion is eliminated. 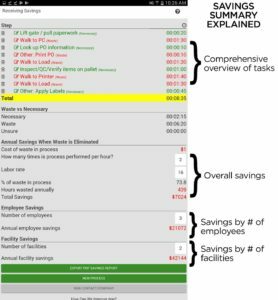 A PDF Savings Summary can also be exported and emailed directly to you and others.